Patrick is one week old and we are enjoying him immensely. He's been a bit jaundiced, but today he is happy cheering on the Tarheels in the ACC tournament championship! The sign on the front door that my precious children made to welcome me and Patrick home. The kids were so happy to have us home from the hospital and are loving having Daddy off from work and Mommom in town to do fun things with everyday. The timing of Patrick's birth worked out beautifully. Will was home from UNC on spring break and my 2 high schoolers are also on spring break. So, they've all been able to help and get to know Patrick. Here my oldest being silly with his youngest brother. 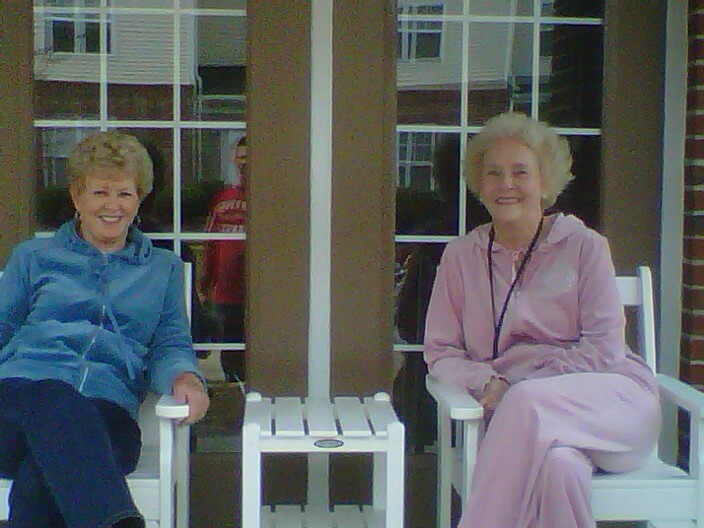 The 2 proud grandmothers......out with Ron and all the kids for a picnic. The weather has been great! 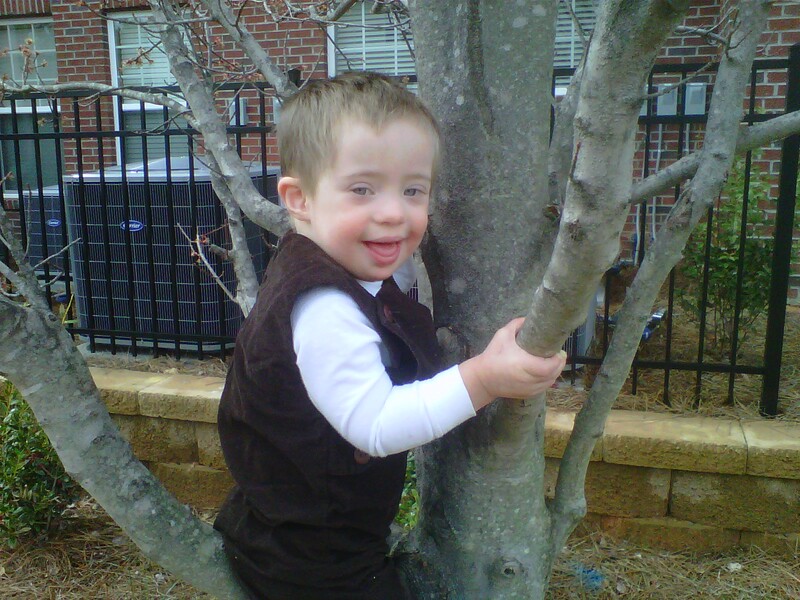 Mattie climbed his first tree with Dad! He's adjusting alright. He's been very shy towards the baby. He doesn't want much to do with Patrick, but I guess he just needs to warm up to the idea of not being the baby anymore. Your children are beautiful! And Patrick is just as handsome. You look great; congratulations on your sweet new boy! Such sweet pictures!! He is so precious, just like the rest of your sweet ones! Patrick is so sweet!! Love all the pictures!!! You have a beautiful family!!! i tried to leave you a message telling you how much i loved these pictures and that patrick's shirts are done, but it didn't work.. love you!! this baby is beautiful!!! Congratulations on your new baby. 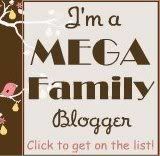 I just came across your blog and have really enjoyed reading it. It's wonderful to have a mother think of her children as "prizes". you don't look puffy you look GREAT! and the baby is beautiful. bless you! The baby is gorgeous and you looked wonderful post-partum! So jealous! All of the kids just look so proud and happy! And WTG Matty for climbing that tree! Thanks for sharing these great pics. All of your "prizes" are beautiful. Matty looks so big compared to the little baby! so cute. You look great- how wonderful to have the family around- those grandmas look pretty proud! Love the pictures! You are definitely a very Blessed Momma. Family is where it is all at and the Lord has truly blessed you all. Congrats to you beautiful new little one. Love the pictures! He is a cutie, and the rest of the kids look very happy to have him there =) You're very blessed. What precious pictures!!! I am really enjoying this peek into your life and remembering the days when I had a new baby at home!! So Special! The world doesn't know what it is missing!!!! Hmmm . . . left a comment and it disappeared, I think?? anyway, just saying that your family is precious and I loved all the pictures! Brought back so many sweet memories for me!